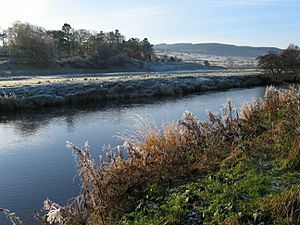 Northumberland (RP pronunciation /nɔːˈθʌmbələnd/ local /nɔːˈθʊmbələnd/) (abbreviated Northd) is a county in North East England. 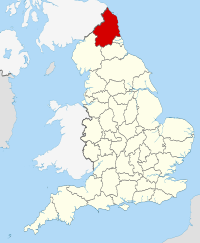 The northernmost county of England, it borders Cumbria to the west, County Durham and Tyne and Wear to the south and Scotland to the north. To the east is the North Sea coastline with a 64-mile (103 km) long distance path. The county town is Alnwick although the county council is in Morpeth (for the moment, as there are plans to move it to nearby Ashington). The northernmost point of Northumberland and England is at Marshall Meadows Bay. 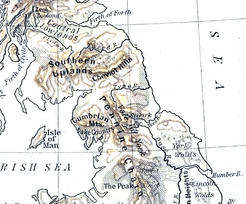 Northumberland originally meant 'the land of the people living north of the River Humber'. The present county is the core of that former land, and has long been a frontier zone between England and Scotland. During Roman occupation of Britain, most of the present county lay north of Hadrian's Wall, and was only controlled by Rome for the brief period of its extension north the Antonine Wall. 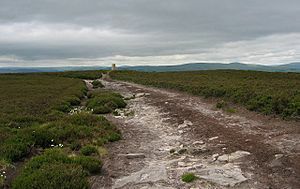 The Roman road Dere Street crosses the county from Corbridge over high moorland west of the Cheviot Hills into present Scotland to Trimontium (Melrose). As evidence of its border position through medieval times, Northumberland has more castles than any other county in England, including those of Alnwick, Bamburgh, Dunstanburgh, Newcastle and Warkworth. Northumberland has a rich prehistory with many instances of rock art, hillforts such as Yeavering Bell and stone circles like the Goatstones and Duddo Five Stones. Most of the area was occupied by the Brythonic-Celtic Votadini people, with another large tribe, the Brigantes to the south. 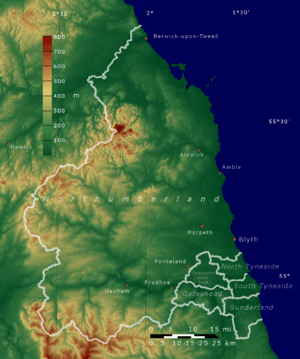 Later, the region of present-day Northumberland formed the core of the Anglian kingdom of Bernicia (from ca. 547), which united with Deira (south of the River Tees) to form the kingdom of Northumbria in the 7th century. The historical boundaries of Northumbria under King Edwin (reigned 616–633) stretched from the Humber in the south to the Forth in the north, although in 1018 its northern part, between the Tweed and the Forth (including Lothian, the region which contains Edinburgh), was ceded to the Kingdom of Scotland. Northumberland has a history of revolt and rebellion against the government, as seen in the Rising of the North (1569–1570) against Elizabeth I of England. 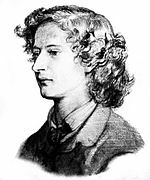 These revolts were usually led by the Earls of Northumberland, the Percy family. Shakespeare makes one of the Percys, the dashing Harry Hotspur (1364–1403), the hero of his Henry IV, Part 1. The Percys were often aided in conflict by other powerful Northern families such as the Nevilles and the Patchetts; the latter were stripped of all power and titles after the English Civil War of 1642–1651. As of 2015[update] Northumberland remains largely rural, and is the least-densely populated county in England. In recent years the county has had considerable growth in tourism due to its scenic beauty and the abundant evidence of its historical significance. Northumberland Facts for Kids. Kiddle Encyclopedia.